This was possibly the best of 6 Lewes pubs tried on Saturday. It has a couple of rooms. As mentioned, the front room is more traditional and seemed to be populated by an older clientele, many of whom were eating. The rear room had a much younger customer base, with a pool table and a TV showing the Old Firm football derby. We positioned ourselves next to the dart board and the Toad in the Hole game. Whilst there were instructions, it still wasn't clear about what serves as the 'toad'! Ales were Harvey's Sussex Best Bitter & Old Ale, Gun Extra Pale, Skinner's Betty Stogs & Tring Ridgeway. There were also a couple of real ciders - Biddenden's Dry & Thistly Cross Whisky Cask. A 5% CAMRA discount is offered. Well situated pub in the high street of this picturesque town. The front part of the pub is very traditional looking, but the back part looks like an add-on. Excellent selection and quality of food, very reasonably priced. Selection of real ales too. This pub is very near perfection,service, beer,food are all great,perhaps the tearful Brighton fans who come In about 17:20 on a Saturday are a let down,all three of 'em,I always ask them the score. Lewes has several great pubs and this just pips it as the best. 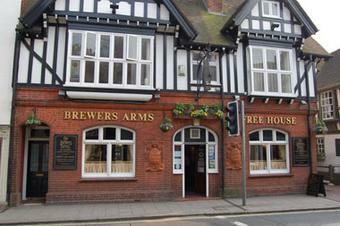 As a traditional English boozer, the Brewer's Arms can't be faulted. An excellent and rapidly turning-over selection of real ales, a comfortable atmosphere and - yes, reviewers have note the preponderence of locals, but they're all very pleasant. Outside the lavs is a list of quotes compiled from regulars which is funny and worth having a look at - they've been published as a book, which is available behind the bar. Food is stunningly good value - the range of what you get here for £4 defies belief. TV sports are available in the back bar but they don't impinge on the settled environment of the front bar at all. As it's Lewes, a Harveys ale will always be available but The Brewer's Arms offers relief to those of us unenamoured with the local brew. Me? I loved the place.